Here's more about the photographers and their selected photographs. This year the major international photography award - for portrait photography - organised by the National Portrait Gallery, London is celebrating the tenth anniversary of Taylor Wessing's sponsorship. The Prize for winning the competition is £15,000. The People’s Pick allows exhibition visitors the opportunity to vote for their favourite portrait in the show. The prizes for the Taylor Wessing Photographic Portrait Prize 2017 and the winner of the sixth John Kobal New Work Award will be announced on Tuesday 14 November 2017 at 19.00. 5,717 submissions entered by 2,423 photographers from 66 countries. A total of 59 portraits from 50 artists were selected for display, in which 18 were part of a series. Photographers were again encouraged to submit works as a series in addition to stand-alone portraits, and there was no minimum size requirement for prints. Their choice gives me a certain sense of "other worldliness" about the prize - and maybe this was the intention of the judges curating the exhibition and their choice. Alternatively maybe this is an expression of contemporary themes and interests of today's photographers. Just three photographic portraits have been shortlisted. 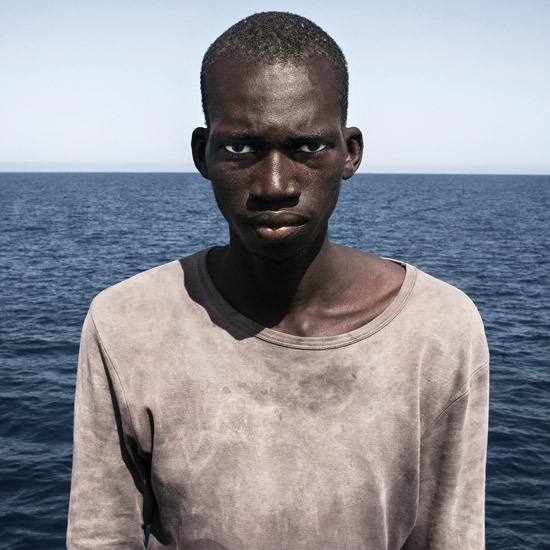 The sitter Amadou Sumaila was photographed in the Mediterranean Sea, in international Waters 20 nautical miles off the Libyan coast. He has since been transferred from a rescue vessel to a temporary reception centre for migrants in Italy. The portrait was taken as part of Dezfuli’s work as a freelancer, documenting the search and rescue of migrants on board an NGO vessel in the Central Mediterranean Route. Occupation: regularly works with scientists; background in photojournalism - photographs engage with science and aesthetics. Art education: Masters in visual journalism ; currently working on her studio art-based doctoral thesis at Aalto University School of Arts, Design and Architecture in Helsinki, Finland. Exhibitions: exhibited in Europe, North America and Asia. 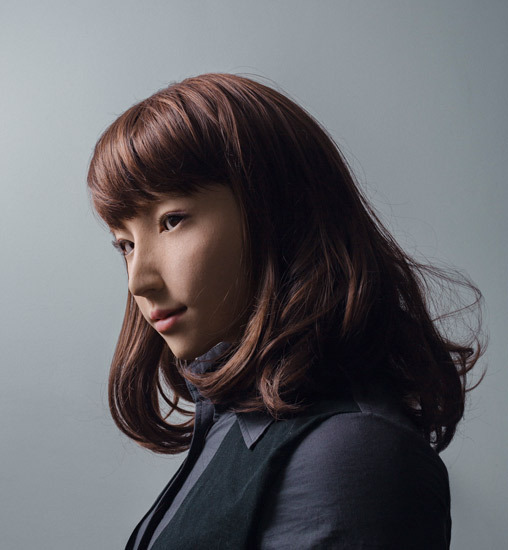 Tammy’s photograph portrays Erica, an android from Hiroshi Ishiguro Laboratories. One of Them Is a Human #1 is part of a broader series which presents androids alongside one human and asks questions about what it means to be alive. The photograph was taken at Ishiguro Laboratory, Department of Systems Innovation at Osaka University, in an experiment room where researchers work with Erica. Occupation: documentary and portrait photographer. Her work covers women’s rights, social development and the aftermath of conflict. spent eight years as a photographer with The Daily Telegraph, covering world events such as the Darfur conflict, the Iraq war and the Asian tsunami, before deciding to go freelance in 2007. Clients: wide variety of clients including Time, The Sunday Times, The Independent Review, Marie-Claire, Tatler, Monocle, Vice, Oxfam, Save The Children, IRC, UNICEF, Sony and BBC worldwide. Previous appearances in this award: The Big O, won 4th prize in The National Portrait Gallery’s 2010 Taylor Wessing Prize. 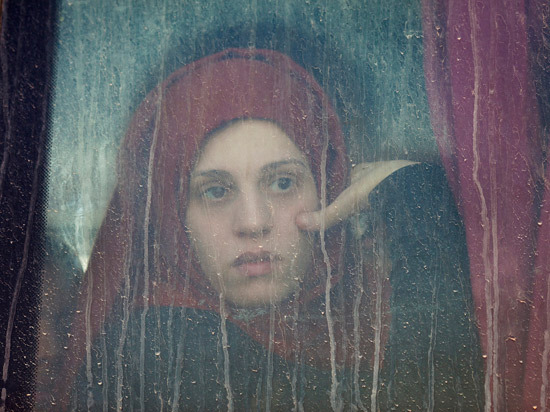 Her shortlisted photograph was shot outside Hasan Sham IDP camp in Northern Iraq. Trayler-Smith was there undertaking a commission for Oxfam documenting the camp where the charity was providing aid, talking to women who had lived under ISIS who were prepared to be photographed. A convoy of buses arrived from Mosul, bringing people to safety who had escaped the battle just hours before. "I just remember seeing her face looking out at the camp and the shock and the bewilderment in her’s and other’s faces and it made me shudder to imagine what living under ISIS had been like. To me the uncertainty in her face echoes the faces of people having to flee their homes around the world and references a global feeling of insecurity." The posts below contain images of past prizewinning portraits. I was absoloutly gobsmacked by the descision to allow a picture of a " Android ,a term I use loosely " in the shortlist. It is an insult to all the hard working and honest photographers to include an entry of a non human when the rules state " a living person " , the other two shortlisted entries are worthy with both being strong visually and telling a story wheras maija tammis entry is very ordinary, well lit but thats it,she claims that it is indicative of the relationship between the subject and a human off shot but I dont buy into this self indulgent claptrap,I think that next year I will enter some pictures of pinocchio with a back story claiming that I am investigating the relationship between humans and what it means to be made from a tree.